Parker is a charming, sociable six-year-old boy who loves the outdoors. Parker has T-lymphoblastic Lymphoma, and recently qualified for a wish with our partners Make-A-Wish® Canada. When Make-A-Wish approached the GoRVing team to help make Parker’s wish for an RV come true, we were more than happy to oblige! A bit about Parker: He likes the colour red, and learning about science. He loves eating macaroni and cheese, and snacking on popcorn. His favourite indoor activities are Lego and watching Spider-man, but he has the most fun outside. That’s where GoRVing, you, and the rest of our outdoorsy community comes in! Parker loves to camp, fish, and hike. Even though he’s still growing, he has a list of places he wants to explore. Canada is full of lakes waiting for Parker to catch fish; full of trails waiting for Parker to hike. Having an RV of his very own will mean the opportunity to create wonderful family memories together in the great outdoors of Canada. Parker is most excited to visit his favourite campground, Emerald Lake, Ontario. It’s no surprise that Emerald Lake claims the top spot on Parker’s list’it’s a kid’s oasis. Emerald Lake gives Parker the choice between a lake and a waterpark to cool off on Ontario’s hot summer days, and plenty of chances to make friends along the way. 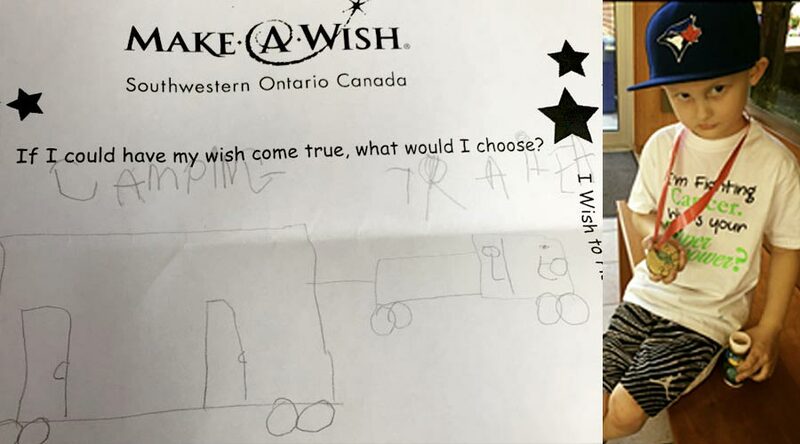 GoRVing, The Canadian Camping and RV Council (CCRVC), and campgrounds and dealers across Canada have partnered with Make-A-Wish to grant Parker’s wish, and to help raise funds to grant the wishes of other Canadian children like Parker, through Canadian RVing and Camping Week. There’s no better time to find your wildhood than Camping Week 2017. If not for your own enjoyment, get out to a participating campground for Canada’s Make-A-Wish kids. Camping Week 2017 is scheduled for Tuesday May 23 through Sunday May 28. Several Canadian campgrounds will offer discounted campsite rates to support the 3rd annual Camping Week. Some campgrounds have planned special celebratory events to complement the Make-A-Wish countrywide campaign events. You can help make wishes like Parker’s come true by purchasing Wish Stars for $2 at participating campgrounds. If you can’t make it out to the campground on Camping Week this year, show your support and buy a Wish Star through a participating dealer, or donate online. Make-A-Wish Canada will receive 100% of the funds raised. Each Wish Star and online donation pushes us closer to our $20,000 goal. It’s just a couple weeks away! Back at the campsite, marshmallows will run rampant around the campfire to support the second event of the Canadian RVing and Camping Week campaign. On Saturday, May 27, campers will gather around the campfire at dusk to roast marshmallows together. The marshmallow roast and Wish Stars are small gestures that everyone can do to make a big difference in a child’s life. The RV lifestyle promotes a sense of community unlike any other. The memories that campers share, whether out exploring or visiting the permanent site, last a lifetime. The RV lifestyle offers quality time with family and friends. It promotes an appreciation of nature, and a genuine love for the outdoors. As kids, there’s nothing better than exploring around the campsite. This sense of community, along with the wonder and wildhood of the great outdoors can give kids like Parker the strength to continue to fight. Join Camping Week 2017 to invite Parker into the close-knit, country wide RVing community and help make wishes like Parker’s come true. Book your stay, purchase a Wish Star, and make your donation online. Join Camping Week 2017 to help grant the wishes of other Canadian Wish Kids waiting for their dreams to come true. See participating campgrounds.